As I wrote in a previous post, zalatina, as it is called in Cyprus, or pichti in Greece, is a traditional delicacy, served as an appetizer, originally made from the head and trotters of the pig, which create a gel when it sets. Traditionally no gelatin was used in this dish, as gelatin is naturally produced from the stock after boiling the head, trotters and tail of the pork which were the parts used and the stock would congeal. The head, feet and tail were cleaned and any hair on them would be scorched and shaved if necessary. The word zalatina is probably derived from the word gelatin, which was produced from the with pork’s head, ears and feet. My mother would make zalatina often but as we did not eat meat from the head she would add some lean meat especially for us. The head, feet and tail would be cleaned and any hair on them would be scorched and shaved if necessary. All these were boiled with spices until tender and then citrus juice and vinegar, salt and some hot red peppers and rosemary were also added. After cooking they would remove all the meat from the head and would put it in earthen pots together with the broth, which would form into a jelly because of the pectin created from the animal parts and from the citrus and a thick layer of lard would form on top, thus sealing it airtight and thus preserved for a long time. The Greek version of zalatina is called pichti (πηχτή) and is made in a similar way, with the addition of vegetables, and different herbs and spices. Pichti is derived from the verb Πήζω (pizo), which means to set, and the word pectin comes from this word. Wash meat and cut into small pieces. Bring to a boil and remove any froth forming on top. Add bay leaves, rosemary, salt and spices and simmer until meat is cooked. Place gelatin leaves in a bowl with cold water, enough to cover the sheets, until they become soft. When the meat is cooked, drain meat and reserve the stock. Measure all the fluid and add stock from the meat until you have four cups. Put the meat back in the saucepan with the stock, add the gelatin and mix until the gelatin dissolves. Adjust salt, if necessary and remove from the heat. Divide the meat into two bowls or into molds and cover with the broth. The broth should be sour so if it is not add more lemon juice. Allow to cool before placing into the refrigerator. Unmold and serve chilled. Decoration is optional. Note: For every 4 cups of liquid you will need 12 sheets of gelatin. If you cannot find Seville oranges, substitute with your favourite citrus fruit. Zalatina, as it is called in Cyprus, or pichti in Greece, is a traditional delicacy, served as an appetizer, originally made from the head and trotters of the pig, which create a gel when it sets. For every 4 cups of liquid you will need 12 sheets of gelatin. If you cannot find Seville oranges, substitute with your favourite citrus fruit. Ummmm…I’m not going to be rude here Ivy but this dish, along with “patsa” bring back childhood nightmares! It’s definitely an acquired taste (I’m sure your one tastes lovely though!). An interesting dish! Light, tasty and refreshing! Peter, like you I also hate patsa and wasn’t the biggest fan of zalatina at the time but this is quite different from the original and if you like pork and sour you will like this dish as well. I’ve had an aversion to gelatins my whole life, apparently for no good reason! When I look at your list of ingredients there is nothing I would not eat nor put together except for those mysterious gelatin leaves. I can’t say I’m going to make it, but the next time it’s offered to me…I’m going to try it! Ivy, happy holidays. I think this recipe is one I would definitely try. I just posted about a stew that is popular along the border and in the Hispanic culture. It’s called menudo. It’s made with tripe, the stomach lining of a cow. If I can eat that and enjoy it, I can see my self eating your dish and really liking it. Thanks for the great recipe. Have a wonderful and safe new year. May 2009 be healthy, happy and prosperous for you dear friend. Bug hugs. I’ve never had zalatina before, but it sounds interesting. And very Greek. It’s presented beautifully. Hope you had a great holiday! Bravo Ivy! Nice recipe! I simply love pichti, it was my granfather’s favourite. 🙂 All the best for 2009 to you and your family! Very interesting dish ivy! really new to me! will try it for sure. Anything with pork in it is good in my books! That looks just wonderful! This dish is very artistic sis. I’m sure it was a welcome addition to your Christmas feast!!! !It’s exciting to think of all the tasty dishes coming in 2009!!!! Ivy, aspics are making a comeback in cooking…no longer relegated to those old, dusty cookbooks. Just you watch…more dishes lie these will pop up. Ivy lead the way! Ivy – I learn about something totally unheard of often at your blog. This looks very interesting… I love using up things that wouldn’t normally be used, you can find pork parts like the listed very cheap here. 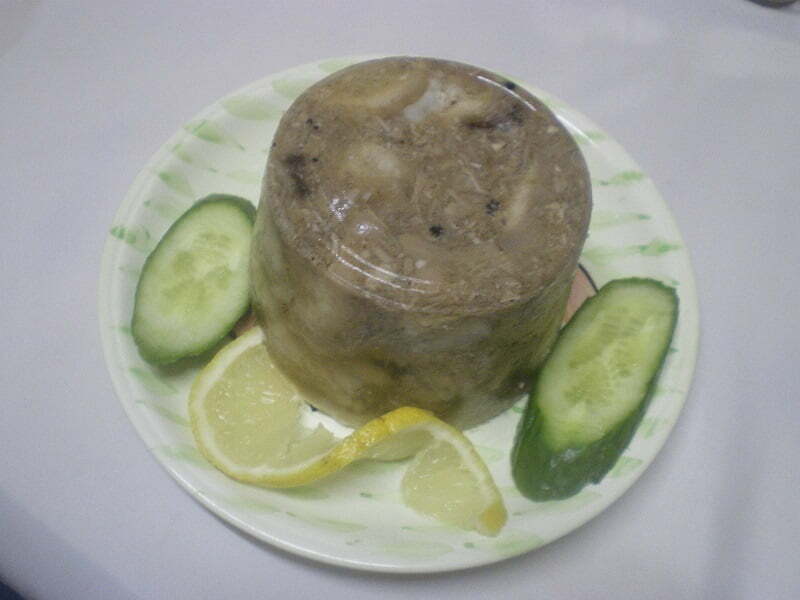 This looks very much like what we call head cheese – actually it is head cheese. My dad used to love this dish and when he’d start, we’d all skatter.